Explorations are made of this daily life over the course of a year. With camera in hand, and with notebook, the photographer/writer attends to what is seen and what is thought as the world appears. The imagination that is given and expanded, as William Blake noted, is of eternal consequence. The inclinations of the observer are existential, romantic, and transcendent. Let us explore then our daily lives over the course of the year. With camera and notebook in hand, we will make our observations of what we see and what we think as the world appears before us. We will become aware and we will give attention to this everyday existence. We are exercising the imagination that has been granted to us, an imagination that is of eternal consequence. Our inclinations are existential, romantic, and transcendent. Think of us as being happy, as being thankful for the wonder of our lives in the course of our daily explorations. At this time in our lives, we will often be found in places where the land meets the water and the sky. We will be on a shoreline of a lake or a river, usually not far from home. This is where we entertain the boundaries and the borders, fulfilling our need to be on the edge, between here and there, now and then. Yearning to be a part of eternity while living in the present moment. We will be taking our wanderings within the places we now call home. Sometimes our farthest adventures take place in the geography of our houses and in our backyards. The changing times of day offer new and altered landscapes. Family and friends, acknowledged here, play their parts in the drama of these days. Behold, our days host the full range of possibilities. Still life: this is what we call this adventure. Time is stopped with release of the shutter, the moment caught as the arrow of time moves on. This is the way we experience the moments of time. Such is our brief glimpse of eternity. And the one who stops time with the camera is still in pursuit of the ultimately unfathomable meaning of it all. 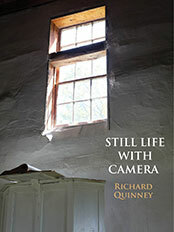 Still life with camera, and occasionally a few words to the day, is our mode of being.